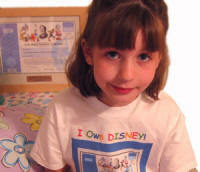 We offer a fun Disney related T-shirt that can make for a cute gift-giving experience. Imagine a young toddler wearing a shirt that says "I Own Disney!". The stock certificate looks just like the real thing. Our shirts are high quality, Preshrunk, 6.1 oz,100% Hanes Beefy T's and come in Children XS, S, M, L.
Find these in our Product Catalog or select the T-shirt option when ordering a share of stock. "#1 Shareholder" is on the stock certificate and "The Road To A Million Begins With One!" is on the plaque. 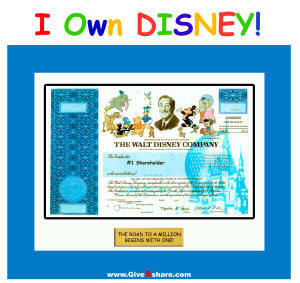 Or purchase as an option when you buy a share of purchase a share of Disney stock.